Kitchen resurfacing is a general term for doing exactly that, changing the material on the surfaces of the kitchen you already have. Whether it is your kitchen doors, cabinets, worktops or tiles, we have different professional products that can transform these areas. 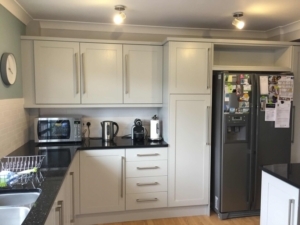 Kitchen doors and units can be sprayed with paint in a variety of colours and sheens. It is a long lasting, durable paint that will bring your kitchen doors back to new showroom condition. The cabinet end panels can have the same treatment or can have bespoke microcement or resin finishes that can be applied in a thin layer over the existing areas. Please see our blog pages for more in depth detail and pictures on these amazing products. Tiles can be sprayed a different colour and the grout lines reinstated to look like new. Resurfacing avoids all the disruption of ripping out what you have. 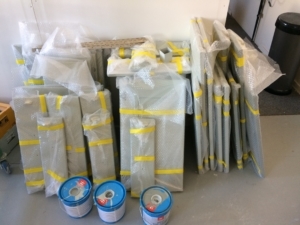 We can also use the same microcement and resin products previously mentioned to go over your existing tiles. This can then give a grout free seamless finish, which looks new, can be matched with your colour scheme and is very easy to clean. Worktops can be a costly and messy process when having to fully replace. Our resurfacing techniques allow us to use either microcement, resin or sprayable products to recoat the surface in a different colour or style. The possibilities for this are only limited to your imagination. We can do anything from a plain concrete style worktop to a glittery gloss unicorn design if you wish. You can get something bespoke and not found anywhere else. All of these resurfacing techniques can be completed in a 1-2 week period giving you a fast, unique and hardwearing kitchen makeover while saving you a stack of cash, compared to a new kitchen install, that you can spend on other experiences instead – like those pilot lessons you always wanted, or maybe a trip to Madagascar! 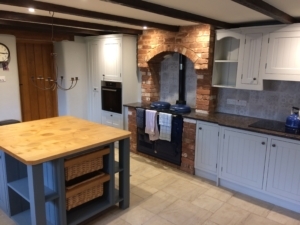 Contact Kitchen Edit today to discuss any ideas you have, we look forward to your call.